Hey there friends! I am excited to share this card with you today using Avocado Arts June set, Let's Catch Up. This is one of those cards that I make that I envision in my mind one way, and then they turn out going in another direction; a better direction! 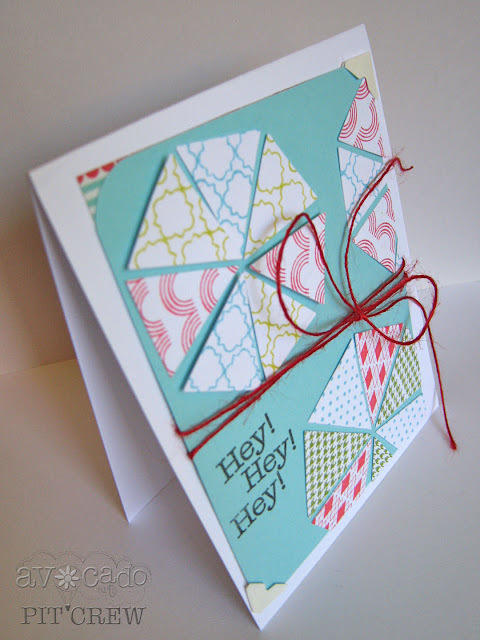 I stamped various borders on cardstock and then die cut them into triangles. My original plan was to assemble the die cut triangles into hexagons, but I think the triangles I used were too narrow so I added another. 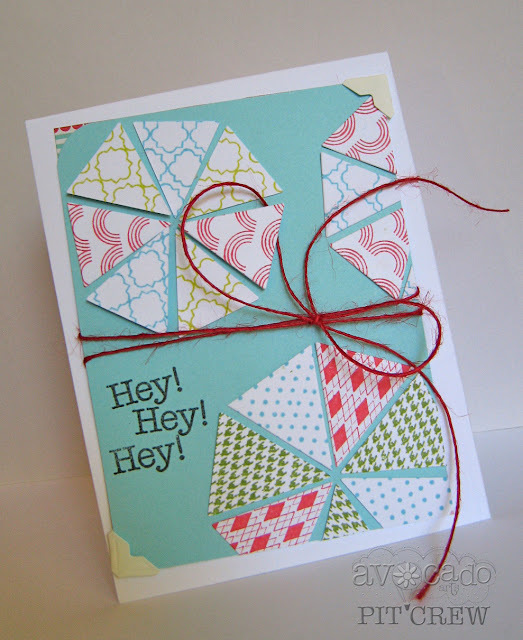 Even though I originally planned a hexagon shape, I like the way the card came out. blues and greens. I popped a few of the pieces up with foam tape which add some fun dimension. Well, that's it for me today. Make sure to visit my fabulous fellow Pit Crew to see more lovely cards! Next month our new Pit Crew will be joining us-soo excited! But, sadly it is one of my dear friend's last day designing with us. I am so sad to say goodbye to Savannah, but I am excited for her new opportunities! I love ya Savvy! Cute card! Are you going to post your paper smooches winner? THANKS for your sweet message in your post--I will miss being on the same team, but don't worry! I will be around:) HUGS!! !